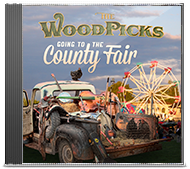 Our latest album titled, Going to the County Fair, is available now! Please visit the Music page for ordering information! August MBOTMA Bluegrass Festival @ El Rancho Mania Richmond Minnesota! Great to see and reunite with new and old faces. Hope to see you fine folks down the road. After 10 WoodPick years. We say goodbye to Dustin Keller as he and his young family begin a new adventure. His engineering job with Arctic Cat will be relocating them. We were very fortunate to enlist Gary Broste as our new Bass player, vocalist. Gary started rehearsing and performing with us this July of 2016. We will be updating our bio info in a couple days, get everyone up to speed. Please stop and say hello to Gary at our upcoming shows!